I obtained this trick from Dr. Haddon, in August, 1904. It was shown him by Dr. S. Levinstein, who learnt it in Leipzig from a travelling troup of Dravidians. 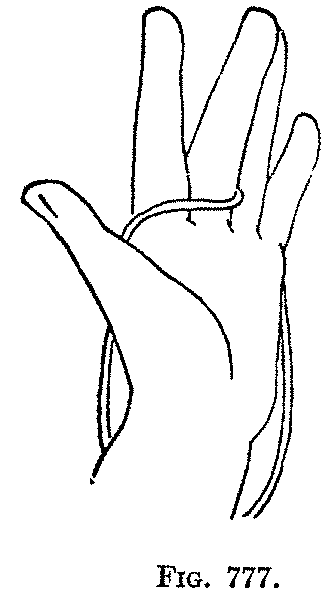 First: Hold the left hand up with the palm to the right, and with the right hand put the loop over the left index and middle finger, so that there is a short palmar string across these fingers and two strings hanging down on the back of the left hand (Fig. 777). Second: Put the right index up under the string on the left palm (Fig. 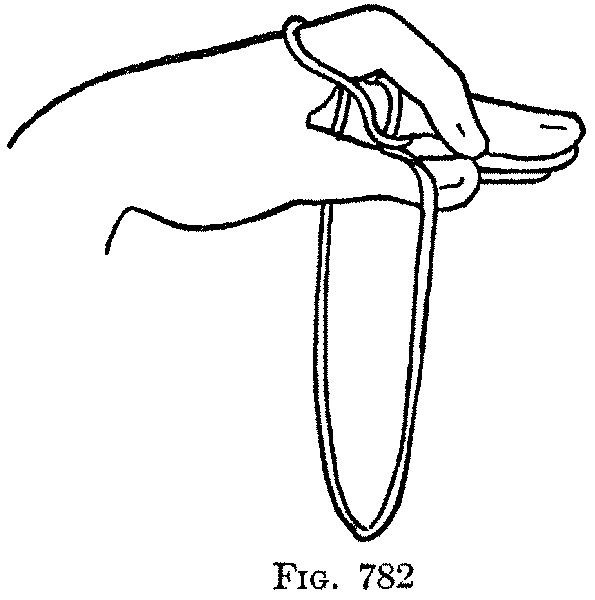 778), push it between the index and middle finger, and catch the near hanging string (Fig. 779), and draw it all the way out to the right between the left index and middle finger and under the left palmar string (Fig. 780). 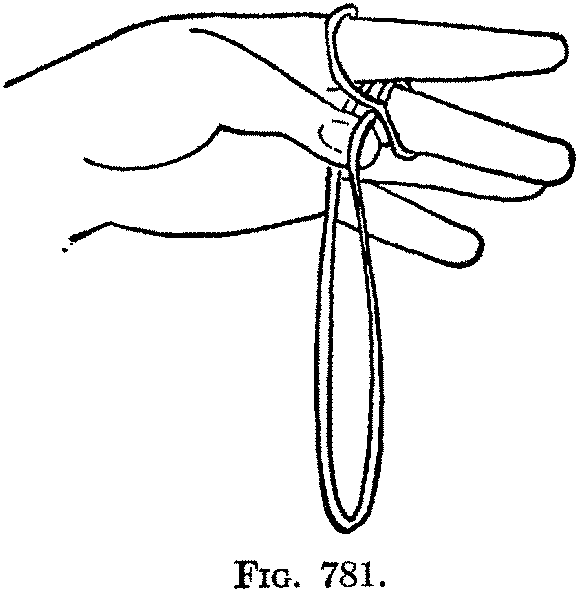 Let the two strings of the loop, formed by drawing out the string, hang down on the left palm. One of these strings, the nearer, is an index string and the other a middle finger string. Arrange them in order side by side. Third: Turn the left hand with the palm down and the fingers directed to the right. Bend the left thumb away from you over the hanging index string, and take up on the back of the thumb the hanging middle finger string (Fig. 781). Now put the tips of the left thumb and index together (Fig. 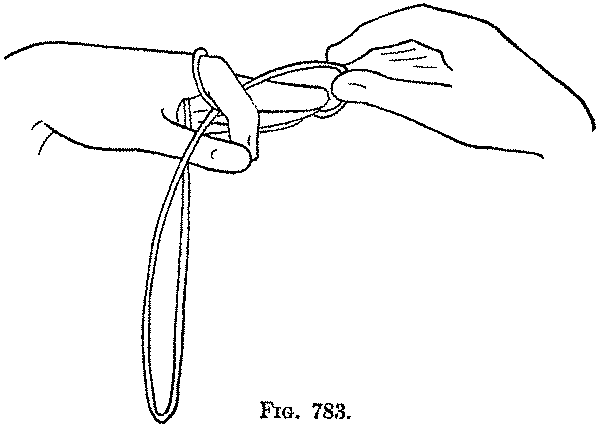 782), and with the right thumb and index remove the loop from the left middle finger (Fig. 783), and let it drop. 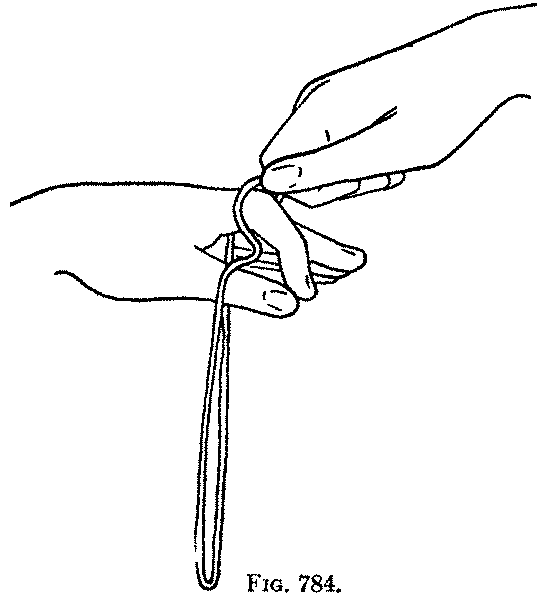 Without separating the left thumb and index, the loop may be dropped off the left hand by a slight jerk, or pulled off by picking up with the right thumb and index the string which passes over the left index, and pulling it to the right (Fig. 784). This trick is interesting largely because it comes from India, where as yet the field is unexplored.